Oakley Blender and Twenty are both new for 2012 and are at the head of optical innovation and technology. Oakley is known across the entire world as the leading specialists in sports eyewear, and their high-end technology and quality products portray this. The new Blender is a great metal iconic Oakley smaller shaped sunglass. The shape is slightly rounded with a curve on the lens for outstanding protection from the sun from all angles. The curve on the lens along with the smaller lens shape means the frame sits right into the eye socket great for a customer who doesn’t like the larger, oversized look that is everywhere at the moment. The Oakley Blender has a small subtle ‘O’ on the arm, but the Blender has a lovely combination of acetate and metal (metal front and acetate arms) with a high quality sprung hinge designed with comfort in mind. The Oakley Blender OO4059 has silicone nose pads that are also used for enhanced comfort, and also can be adjusted to fit wider and smaller bridges. Oakley Blender has some lovely colour options, with gold, silver and lead available and polarized lenses also available. Alternatively the new Oakley Twenty is a plastic option, again with a smaller lens. Oakley has jumped on the fashion band-wagon with some of their sunglasses being larger and more high-fashion however the Twenty is a smaller option for all those traditional Oakley lovers. The Twenty has the option of the famous Fire Iridium lenses, which are bright, bold and offer balanced light transmission and reduce glare. The Oakley Twenty are also a reasonable price, which means you can get Oakley quality at a decent price! Oakley sunglasses and spectacles are designed to serve the needs and demands of athletes and that is why the three-point fit was introduced. The three-point fit means that the sunglasses only touch the face behind the ears and on the bridge of the nose, ensuring they will grip and be comfortable at the same time. Tom Ford has produced some absolute trendsetters and the old classics always seem to be the best for Tom Ford. The TF008 Jennifer, TF009 Whitney, TF035 Charles and TF076 Raquel sell year after year from Tom Ford and Sunglasses-Direct. 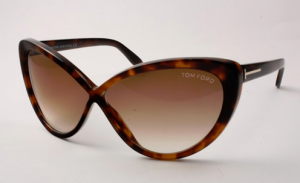 The classic Tom Ford Jennifer TF 008 put Tom Ford at the forefront of the sunglasses fashion market many years ago and it still out sells the other designs to this day. The classic shape of the Tom Ford Jennifer with the cut-out lens and gold band on the temple area made Tom Ford break through into the sunglasses market and got the Tom Ford brand into the luxury fashion market. Tom Ford Jennifer is available in several colours , some new some older but the colour 692 transparent rust brown has always been the top seller and works with any outfit- casual or smart. Tom Ford TF009 Whitney is also an old classic that is slightly larger than the Jennifer but also has the gold band on the arms. The Tom Ford Whitney however has the iconic crossed bridge piece that turned made Tom Ford sunglasses recognizable alongside the gold T or band. The Whitney is a very glamorous frame hand assembled in Italy for unbeatable quality and comfort. Again, the best selling colour in the Whitney is the 692 transparent rust brown. Tom Ford Charles is another classic to add to the list- a totally timeless frame that is suitable for both men and women, and look great on both! Tom Ford Charles TF035 has been spotted on many celebrities and a lot of Tom Ford sunglasses and spectacles are a celeb favourite. The best selling colour 753 is subtle and the gradient tint provides a good tint depth but looks great too on the face. Tom Ford Raquel is a large squared shape acetate frame the famous gold band on the arms. Similar in style to the Jennifer and Whitney it is a guaranteed seller from Tom Ford with the chic, oversized look that is so popular. All the Tom Ford sunglasses come with an authentic case, box, cleaning cloth and authenticity card. Tom Ford sunglasses are only available to order over the phone with Sunglasses-Direct as they are such a high quality item, service and advice is the key. Call us on 01159589820 to order your new Tom Ford sunglasses now! Oakley Crosshair is a frame that has sold really well for Oakley for a few years now, and now they have released this brand new frame for 2012. The shape is similar to the old 2011 model however they have put a slight twist on it- with a lightly deeper lens. Oakley Crosshair has some awesome colour options and alongside the outstanding lens quality and technology it’s sure to be a hit with Oakley lovers and new buyers! The lens technology behind Oakley including the HDO (High Definition Optics) which means the HDO lenses lets you see clearer, sharper and without magnification like ordinary wrap lenses. With the lenses in the Oakley Crosshair you see everything exactly where it is unlike some other sunglasses which can cause a shifted like view. They also offer 100% UV filtering and awesome impact protection, which means your eyes are protected to the max! Polarised lenses is always a great option for those that wear their sunglasses a lot- or in bright light conditions as they cut out glare. The filtering on the lenses cuts out the type of glare that makes you squint alongside great clarity of vision with Oakley lenses. Polarised lenses also improve the depth perception. Another technology from Oakley applied to the Oakley Crosshair is the impact protection which is designed to protect your eyes through all impacts unlike many other sports and normal sunglasses. Oakley Crosshair comes with free delivery in the UK from Sunglasses-Direct, if you have any questions about the Oakley Crosshair call us on 01159589820 and one of our team who are trained Oakley specialists will be able to assist you. Tom Ford has launched the brand new Colette for spring/summer for 2012. It has a real Tom Ford feel with the crossed bridge that is well known in many of Tom Ford’s best selling sunglasses. The Tom Ford Colette TF250 although it has a metal rim it has the appearance of rimless as the lens sits on top of the metal rim – a modern, chic look! Tom Ford Colette has a thin, discreet metal arm for a subtle look, with an ultra glamorous effect. Tom Ford Colette comes in some stunning colours including an alternative pink gradient lens, which is a little different from your normal type of darker lens, which is widely available now. The TF 250 also comes in some lovely gradient lens colours but the pink stands out from the crowd. When on the face the colour 28B lens means your eyes are very much visible through the lens unlike most of the other options. A few years back the lighter tints were the only think available and now its getting darker and darker, so if you miss the light, bright tints colour 28B is for you! Tom Ford sunglasses have been quite heavy but the TF 250 is superlight and comfortable- great for everyday use. Ray Ban RB 4175, new introduction to RayBans Clubmaster style collection made iconic in many blockbuster films and worn by the rich and famous. Ray Ban 4175 has a full plastic top bar with Ray Ban plastic sides which has classic clubmaster lower rims on the front of the sunglasses. Ray Ban RB 4175 is available in 4 colour, black with dark G15 green-grey glass lenses, tortoise brown with gradient brown lenses, white with gradient grey-brown lenses and black with gradient grey lenses. All have Ray Ban crystal lenses to give full protection against harmfull UV light. Ray Ban 4175 sunglasses are supplied with a Ray Ban case, cloth and box. Delivered sppecial delivery to the UK (london, manchester etc). In January 2012 two of Sunglasses-Direct ‘s team – Rachel and Helen visted Venice with Luxottica Group. Most consumers have never heard of Luxottica however they are a leader in premium fashion, luxury and sports eyewear, with 7,000 optical and sun retail stores in North America, Asia-Pacific, South Africa and Europe and a strong and well-balanced brand portfolio including Chanel, Prada, Prada Sport, Ray Ban, Oakley, Persol, Dolce and Gabbana, Ralph Lauren, Bvlgari, Tiffany, DKNY, Miu Miu and many many more. So, Luxottica are responsible for most of the designer high-fashion eyewear you see in stores and online. As an Elite Client of Luxottica we were lucky enough to be able to visit the factories in Agordo where all the world’s sunglasses and spectacles are designed, produced and dispatched from. The factories in Agordo (which is a around 2 hours in land from Venice ) are set in some of the most stunning backgrounds with the mountains out the windows- a truly beautiful place to work. The size of the Luxottica factories is something that has to be seen to be believed, they are on a scale that is hard to comprehend. Actually witnessing the processes it takes to make one frame was quite astounding and is a very time consuming process. To make a pair of Ray Ban Wayfarers the total process from start to finish takes around 3 months and each part is assembled by hand not machinery. So when you are buying a pair of Ray Ban’s from Sunglasses-Direct you are investing in a quality product. The extensive warehouse where all frames are stocked is vast, with a state of the art picking and delivery system, frames are delivered across the whole world from one warehouse, with over 5 million frames in stock at one time the stock levels are outstanding, which means when Sunglasses-Direct doesn’t have the frame in stock Luxottica can normally get it to us within a week. Alongside viewing the factories in Agordo, Luxottica put us up in a stunning hotel over looking the water near St Mark’s Square, and also hosted a Masquerade Ball in an old Venetian Palace where along with many other eyewear professionals from the UK, we enjoyed a lavish evening of food and entertainment. A truly amazing trip from Luxottica for the Sunglasses-Direct girls! Tom Ford Madison TF 253 is Tom Ford’s master piece new for 2012 sunglasses season. The Madison design is a stylish up swept acetate sunglasses with a 1950’s meet modern day twist. Tom Ford Madison TF 253 got it’s name from Tom Ford’s Madison Ave flagship boutique, where he shows his lines of men’s suits, shirts, perfumes and made to measure clothing range. Tom Ford Madison TF 253 is sure to be a big hit this summer, with its large acetate design and classic Tom Ford cross over bridge, the Madison will be must have sunglasses this summer. Tom Ford sunglasses are available at Sunglasses-direct.co.uk and can be posted special delivery anywhere in the UK(London, Manchester Leeds, etc). Please telephone our sunglasses specialists for advice and to purchase.